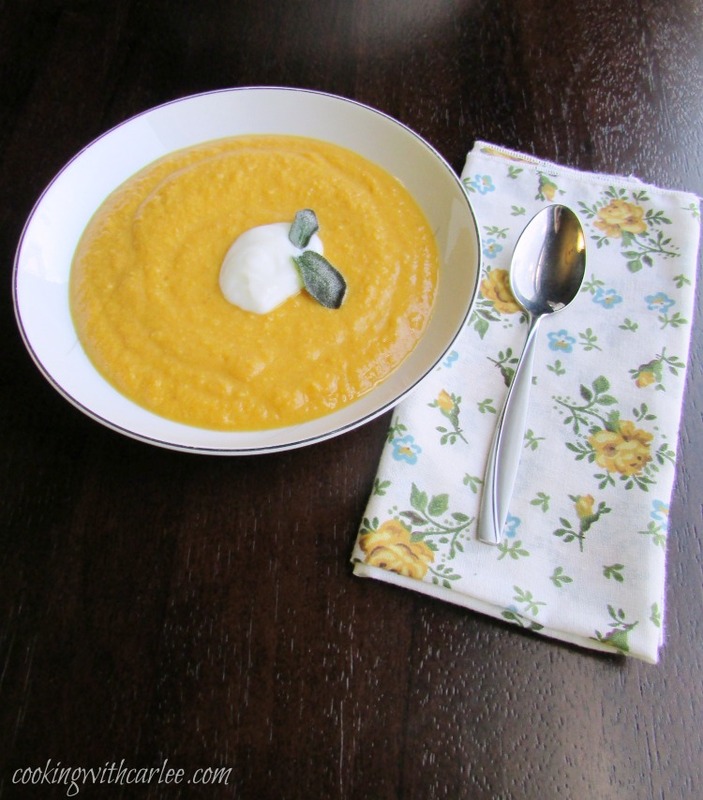 This savory pumpkin soup is perfect for fall! It is creamy and kissed with yogurt and whipped up with fun spices as well. It will warm you from the inside out! I'm sorry. No, truly. I'm so sorry. I feel like I didn't prepare you for all of this fun. I was so busy telling you about #appleweek that I didn't have time to properly prepare you for what was coming behind it. That's right, batten down the hatches because #pumpkinweek is blowing into town! I really want to tell you there is something super fun coming behind that to (because there totally is!! EEEEEK!) But right now we need to focus on the matter at hand, pumpkins and lots of them! We were first introduced to this soup at our birthday dinner last year. You see, Matt and I have birthdays one week apart and his brother Zach's birthday is the day after mine. So we spend the week parading from one birthday dinner to the next! Last year Matt's dad and his wife, Lisa, served us a delicious dinner that started with a perfect pumpkin soup. She had made her own pumpkin puree with pumpkins right from the garden. She even served it out of a parbaked pumpkin. It was such a fun presentation to a really lovely soup. Of course I had to get my hands on the recipe. She was happy to share! This is slightly different spin on her recipe, mostly because she used mostly fresh savory and garlic. I don't have any savory in my herub garden so I took a slightly different spin with a bit of ginger. One of these days I want to try my hand at fresh pumpkin puree, but that just wasn't meant to be this go round either. I hope you love this savory and delicious soup as much as we did. It is a perfect starter course for a dinner party or a great warm and comforting lunch or dinner on a crisp fall day. In a large stock pot or dutch oven, melt the butter or coconut oil over medium heat. Add the chopped onion and cook until it starts to soften. Add the spices and cook until fragrant. Stir in the pumpkin and milk, allow to cook just until a low boil and then reduce to a simmer. Cover and simmer for 10-15 minutes. If you would like a smooth soup, either blend it until smooth or use an immersion blender until the onions are completely processed. Stir the flour into the yogurt and then stir the yogurt into the soup. Continue to cook until heated through. I like the soup on the thick side, but feel free to thin it out with a bit of water or broth until you get the desired consistency. Season to taste with salt and pepper. Serve with a dollop of yogurt and either a fried sage leaf or a few toasted pumpkin seeds. And now to see what everyone else made for #PumpkinWeek! Thanks to Terri from Love And Confections for putting this all together. Double Pumpkin Gnocchi from Caroline's Cooking. Gigi's Spiced Pumpkin Pecan Bread from Family Around The Table. Lisa's Pumpkin Soup from Cooking With Carlee. Pecan Pumpkin Cobbler from Hezzi-D's Books and Cooks. Pumpkin Cookies with Butter Rum Icing from Grumpy's Honeybunch. Pumpkin Muffins from Cindy's Recipes and Writings. Pumpkin Pretzel Bites from A Kitchen Hoor's Adventures. WHAT pumpkin week!!!! YES!!!! Whoo hoo. I was so busy concentrating on the sweet pumpkin treats that I forgot about the fact that I like savory too, so this soup is right up my pumpkin Alley, LOL! I know, right? Your pumpkin palooza definitely got me in the mood! I usually think sweet too, but I love savory pumpkin too. Oooh. I really want to roast my own pumpkin sometime soon too! Thank you! This pumpkin soup looks and sounds so delicious. Thanks Carlee for sharing the recipe at Cooking and Crafting with J&J. 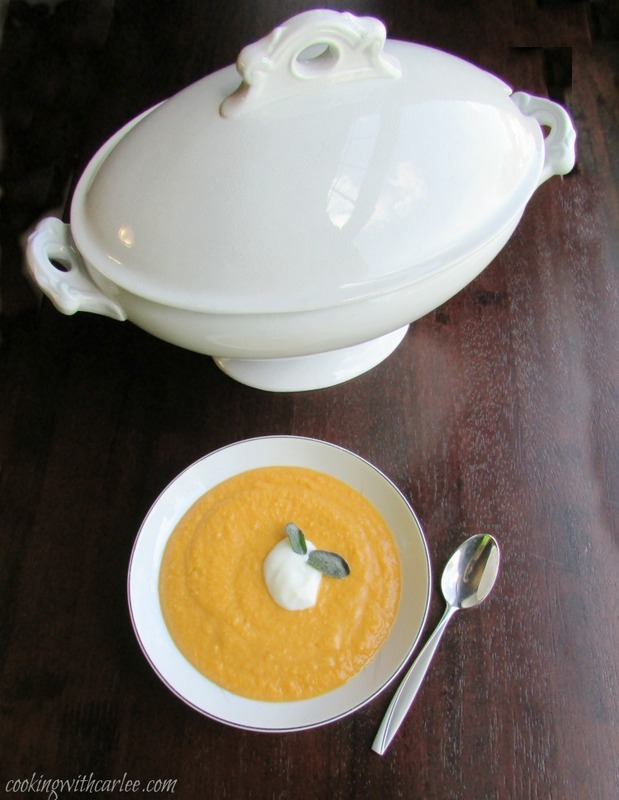 I love pumpkin soup, so comforting and nourishing. I'm loving soups right now! I'll have to give yours a try! I hope you love it, Michelle! I am a soup girl too, especially this time of year! Hi Carlee, your recipes never fail to make me hungry! Soups are one of the things about winter I love, and I can't say I've ever had a pumpkin soup before. The pumpkins here are massive. Any idea if the soup freezes well? Thank you so much, Debbie! I haven't tried freezing it, but I can't see why not. I would try freezing it before you add the yogurt though if possible. What a perfect soup to warm up with on a cool fall day! I really love squash soup, and this sounds similar, so I know I'll love it. I like the spices added too; tumeric is so good for you, ginger is tasty and helps thin my blood, and so does garlic. This recipe has my name all over it! 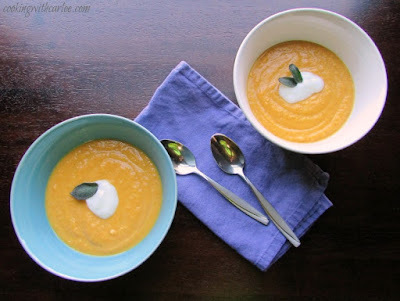 Pinning to add to our menu rotation for the winter, we love soup to warm us up from the inside out! Thanks, Nikki! I really like the pumpkin soups that add cinnamon and nutmeg too, but thought it would be fun to go in a different direction this time! I hope you love it! We will really enjoy your delicious Pumpkin Soup and thanks so much for sharing it with us. Hope you will come back to see us at Full Plate Thursday real soon and have a great week! 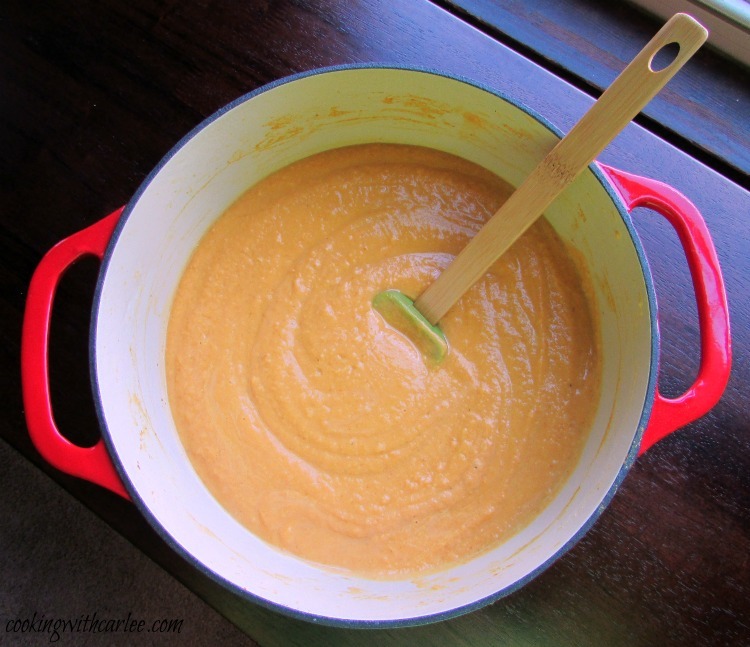 I love butternut squash soup so I need to try your pumpkin soup real soon!